I am a graphic designer who focuses on information design. My day job? I am the data visualisation manager for the Federal Reserve Bank of Philadelphia. (This blog is my something I do on my own time and does not represent the views of the Fed, blah blah blah legal stuff.) And with my main interest in information design—be it in the shape of clear charts, maps, diagrams, or wayfinding systems—I am fortunate that my day job focuses on data visualisation. Outside of work, I try to stay busy with personal design work. Away from the world of design, I enjoy cooking and reading and am interested in various subjects from history and geography to politics to science to the arts. And I allow all of them to influence my work. It is a mad, mad world out there these days and I suppose this is the point at which we all begin to run around shouting that the sky is falling. Despite all the madness in Libya, the constitutional referendum in Egypt, the protests in Syria, the election in Haiti, and the president’s overseas trip to Brazil we still have the aftermath of the Sendai earthquake and the subsequent Pacific tsunami. The latter being particularly important because of the damage to the now infamous Fukushima Daiichi nuclear generating station in northeastern Japan. Fukushima will likely be up there with the three other major nuclear disasters of a power station variety: the Windscale Fire in Cumbria, England; Three Mile Island outside Harrisburg, Pennsylvania; and of course, Chernobyl in the Ukraine (then the Soviet Union). We sometimes have heard the media compare Fukushima as the next great nuclear disaster, but how bad has it really been? 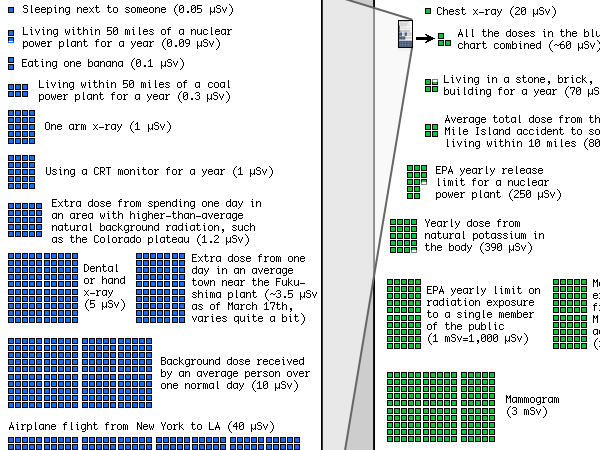 This graphic by XKCD comes to me via my coworker, Brian Morgan, and it breaks down our average exposure to ionising radiation—the bad stuff—from nuclear accidents from Chernobyl to Fukushima to x-ray machines to the natural radioactivity in the soil. Yes, you are likely being irradiated as you read this post. Radiation is bad. But we will all find better solutions to problems if we keep our fears both in proportion and in check. Fukushima is not good. But it is far, far from the end of the world. Two hundred years later, and the US Navy is again in action off the shore of Tripoli. Except instead of calling it the Barbary Coast, we now typically see the name the Maghreb. Things will surely be fluid and changing far faster than I can hope to detail in graphics, let alone follow casually. However, this here details what I have learned since this morning. 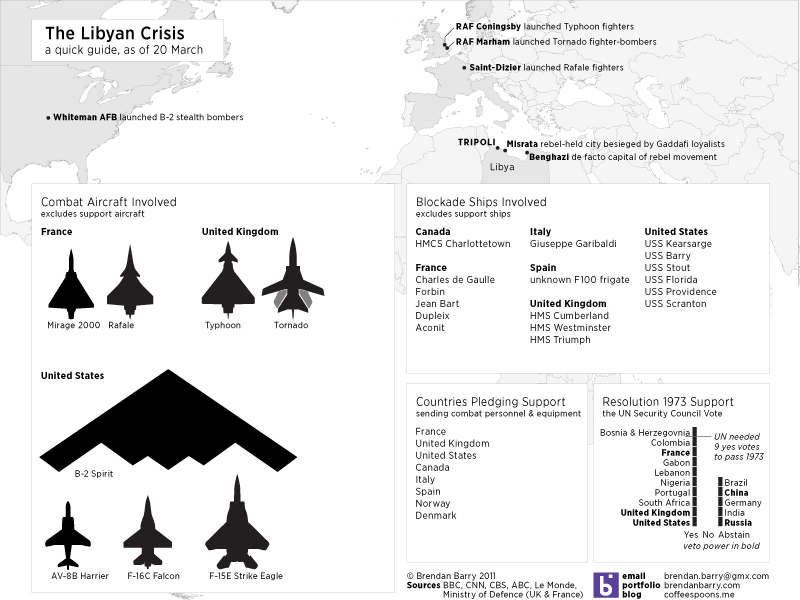 Nothing too fancy, just mapping out some places to show just how far American, British, and French warplanes are flying to reach Libya. Then what aircraft are being used, at least that we know of, what ships are in the blockade and lastly who supported the Resolution 1973. By Monday we shall surely be seeing further attempts by news and media agencies. One of my interests is genealogy/family history. While everyone is certainly more than the sum of their parts, that sum of parts is the history that led to your existence. And I find that notion fascinating. 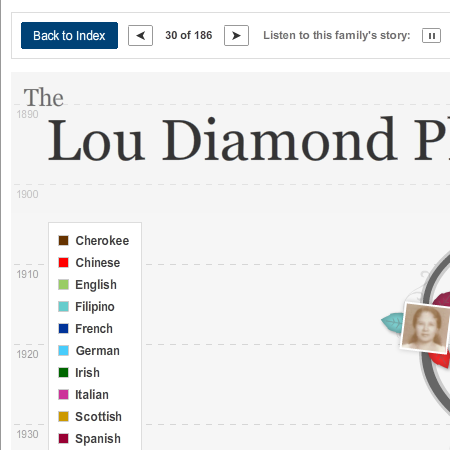 When looking around the New York Times, I came across this interactive piece about complicated family histories. I am unaware of the exact impetus behind the project, but it probably has something to do with the unfolding US Census results and the increasing number of mixed marriages and thus genealogies. But I cannot say for certain. The design of the piece is an interesting decision. Instead of a complicated and unwieldy diagram with lots of details, the designers chose to focus merely on photographs, when available, and little, coloured leaves to denote the ethnicity of each individual. This works to a degree in communicating simple ethnic ancestries, however, when one begins to have shades of light blue to distinguish between disparate ethnicities, one can begin to see a flaw in the system. As someone interested in genealogy, the details are a bit light—but that was not likely the main intent of the piece. Beyond that, there are privacy issues with which to contend. But, if you wish, the New York Times does allow you to upload your own tree and even audio—to 10 megabytes. Perhaps in the future I shall upload a simple version of mine. All in all, an interesting piece. If you have been living under a rock—or perhaps I should say isolated at an oasis deep in the Sahara—you may not have heard that these are some interesting times in northern Africa and the Middle East. Popular protests begat revolutions that have now toppled two governments, Tunisia and Egypt, and quite possibly a third in the near future, Libya. And for those that have not seen governments fall, Bahrain, Yemen, Algeria, Jordan and Morocco have all been disrupted to some degree by protests against the governments in power. Perhaps one of the defining characteristics of these movements have been the social-networking and mobile communications that spread the news of protests, riots, and crackdowns like wildfire. Sites like Facebook and Twitter were instrumental in passing word and for many other, people simply used their mobile phones to spread the news. CNN has this series of maps to highlight internet and mobile phone use in the region. Nothing particularly fancy about the maps, though I wonder about the choice of green to represent so many Arab nations. Intentional or coincidence? Regardless of the colours, I think these maps are an example of using simple informational-based graphics to support a story. And given the goings-ons in the world, I thought this worth posting. From CNN via a post at the Map Room. Presidents’ Day originally celebrated the birthday of George Washington, the first president of the United States. (Though, one could get crazy and say it was actually Samuel Huntington, but I fear I would digress.) Now technically the holiday still does celebrate Washington as the official name of the federal holiday is Washington’s Birthday, but by and large we group folks like Lincoln in there too. Regardless of who exactly is remembered, we remember a United States of the 18th and 19th centuries. And thus it seems appropriate to share a piece from Charles Blow over at the New York Times. 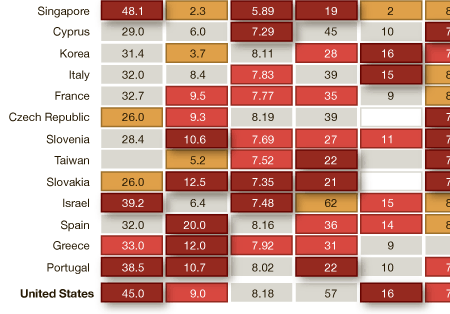 The information graphic is a heat chart of various rankings and index numbers that compare the United States across various metrics to the rest of the world’s “advanced economies”, as decided by the IMF. I certainly have some issues with a few of the metrics, for example what exactly does Gallup mean by percentage of people thriving? And are the math and science scales out of 600 total points? I presume as much but cannot be certain. These could have briefly explained in the footer, or similar to how the food insecurity metric is handled—though I suspect that would be too much from an aesthetic standpoint. The use of drop shadows, from a design perspective, I disagree with; the dark crimson should surely be enough distinction to stand alone. And for completeness, I would have included what appears to be the beigish middle ground between the best and the worst in the scale at the top of the piece. As to the story the piece supports, I leave that for the audience to decide. Is the United States of the President Obama/Bush as great as that of President Washington/Adams? I would have become an arborist…alas, I am a mere designer in a world where trees shed leaves, not cash. The government, on the other hand, now that sheds a lot of cash. From one side of the aisle we hear arguments about how we must cut spending from things like education and infrastructure while the other side pushes back. 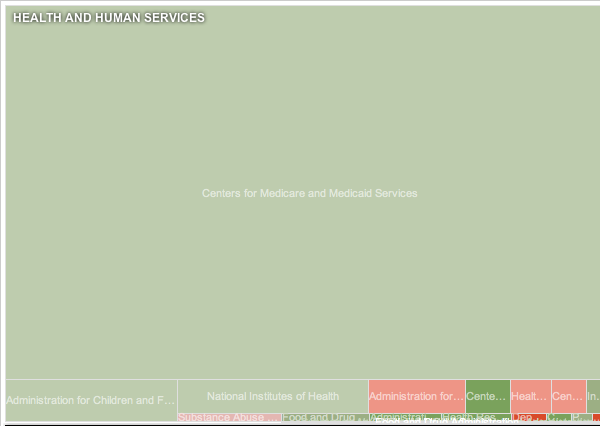 However, what this piece does quite nicely is allow the user to isolate mandatory spending. That is, we see that if we really wanted to cut spending, we would need to look at reforming Medicare, Medicaid and Social Security and then cutting the Defense Department budget. At last, something on which we see bipartisan agreement, reforming and cutting those budgets is too tough (read likely to cost representatives, senators, and presidents their jobs) and so they are left alone. But, I digress. Furthermore, the piece adds the change in spending since 2010 for the various programs by way of greens and reds. While certainly not necessary—one could argue that the inclusion of such data makes a sometimes difficult chart type that much more difficult—I think that in this case the additional data is more than worthwhile. This year’s theme seems to be austerity and that means cuts. So while highlighting, say, the massive portion of government spending that is Medicare, Medicaid, and the US military we can also highlight that much of all that spending is still rising. Courtesy the New York Times, designer Ji Lee now, however, offers you not the staid and static symbol of love we have all come to know and love, but now a true choice of form and symbol. Which would you choose? Charging the Flux Capacitor: No Lightning Required. My co-worker, Ben, who is far more knowledgable about cars than myself, brought the following to my attention. At the Consumer Electronics Show we always get to see the latest in cool, new, must-have toys. This year, however, a company called Fulton Innovations displayed a proof-of-concept, wireless charging-station for electric vehicles. And while one must wonder about the conservation and inefficiencies of such a powering station, Fulton provided information on just how efficient their system would be. In the form of graphics. And by and large, they are not bad. Yes, yes, the pie charts could be substituted for something else. But, I do like linking the colours in the pie chart to the parts in the power-system located in the diagram of the car. They help to explain just where exactly the inefficiencies in the system are to be found. 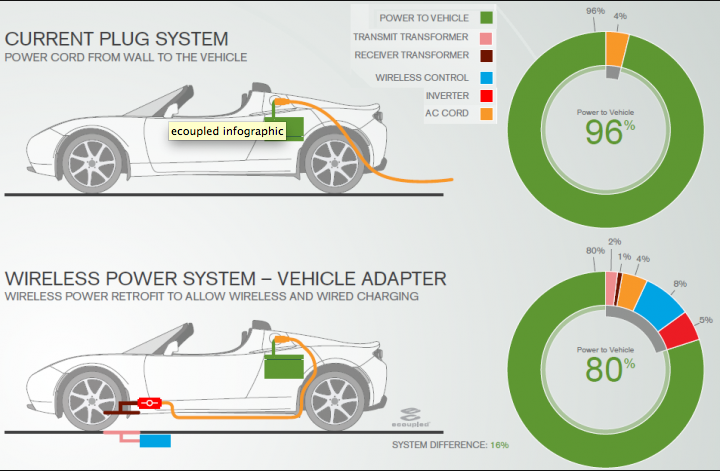 And by providing the base of the plugged-in car, they also allow one to compare the two methods of wireless charging to that of plugging the vehicle in. Author Brendan BarryPosted on 12 January 11 11 November 16 Categories UncategorizedTags advertising, diagram, illustration, pie chart, science, transportationLeave a comment on Charging the Flux Capacitor: No Lightning Required. For those who may not be aware, part of Africa’s largest country is holding a referendum on whether it should remain a part of Sudan or secede and become an independent state, Southern Sudan—though one wonders if they would not come up with a different name. About 2005 a peace agreement all-but-ended a decades-long civil war in Sudan and as that violence subsided the attention in Sudan shifted to Darfur. 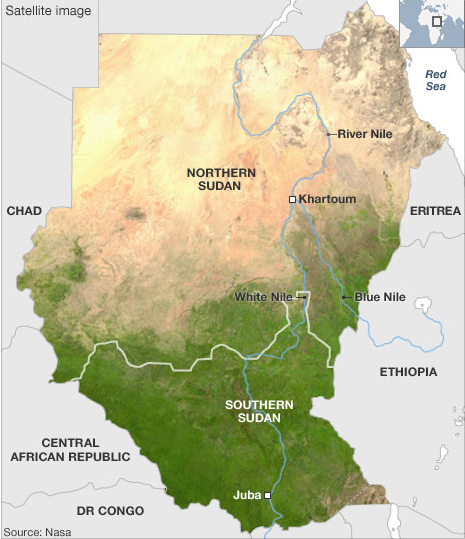 The terms for the peace deal included a referendum on independence for Southern Sudan, long since joined with the northern half of Sudan as part of a British colony in Africa to control the Nile River. The two halves of the country were and are very much different and the BBC has used maps to highlight these differences. The problem is that there are oil fields along the proposed border and a disputed region, called Abeyi, has significant deposits of its own. And so the question of who controls the oil and thus the money and the power remains. That, however, is a story for another post. This is just to highlight the maps. Overall, not bad. I find using the different hues for the different subject matters a smart idea. The shift forces the audience to focus on the change in meaning, which is very important if the shape of the coloured area is not otherwise changing. That said, the infant mortality choropleth uses too great a shift in hues between data bins when compared to the water, education, and food security maps. The oil field map, while not necessarily a data-heavy map in the same way as the choropleths, is a nice bookend to what started the series, i.e. the satellite view. These highlight the sheer environmental and, in a fashion, economic differences between the two regions of Sudan. I find the ethnic groups map, however, the most difficult to fit into the series. Certainly from a subject matter it is the most important. However, the colours chosen to represent the various ethnic groups seem disparate. The southern Dinka, for example, are represented as an olive-green whereas the northern Beja are more of a bluish-green. I think a better solution would have been to keep the three main groups, i.e. the Arabs, Northern Sudan, and Southern Sudan, and then assign each a different hue, for the sake of an example say the three primary colours. Then within those groups, different tints for the various but related ethnic groups. This would highlight the various ethnic groups existing across Sudan, but show the geographic split between the two groups. Overall, a good effort from the BBC to highlight the stark differences between Northern and Southern Sudan. 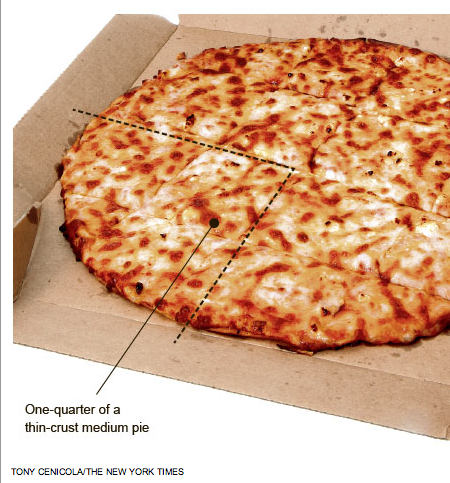 May I Have Pepperoni on That Pie (Chart)? I love pizza. I think most people do too, though, we can all disagree on whether thin crust or thick crust is better. Yet as someone who has now eaten both…well…I shall not wade into the matter. But, I will toss up this piece from the New York Times. The paper has an article about Domino’s adding more cheese to their pizza to increase sales as part of a plan from a US government-supported agency. At the same time, the US government is also trying to reduce the amount of saturated fats consumed to reduce obesity. And of course cheese contains saturated fat. Naturally, the supporting graphic should make use of pizza. And in what better form than as a pie chart. Author Brendan BarryPosted on 8 November 10 11 November 16 Categories UncategorizedTags just for fun, New York Times, pie chart, politicsLeave a comment on May I Have Pepperoni on That Pie (Chart)?